Deciding on a product type is dependent on the type of incontinence (bowel vs. urinary), the level of absorbency needed, and personal preference. It is also important to get the correct size for the best performance. Brand is a personal preference, but some of our brands are more absorbent. They are more expensive per piece, but you will use less of them. Disposable underwear are discreet, comfortable, and highly absorbent. They allow the wearer more freedom than an adult brief, so they are a great choice for active adults. We carry over 30 different types of disposable underwear for moderate to severe urinary incontinence. Adult briefs are traditionally used to care for individuals that are bed-confined and/or experience heavy incontinence. High quality adult briefs, such as those used in care homes, are not available in retail stores. Home Delivered has a complete selection of absorbencies and sizes (including bariatric), so you can manage any level of incontinence at home. Living with light or stress incontinence can be easily managed using small bladder control pads. Prevail, Dignity and Molicare pads come in a large range of shapes, absorbencies, and sizes to manage your individual needs. Our shaped pads are a discreet replacement for adult briefs or underwear if your level of incontinence is easily manageable. Booster Pads are inserted inside an undergarment for extra absorbency. Urine passes through it once it is absorbed, so the undergarment and pad are both working to keep skin dry. We have a great selection of booster pads from brands you trust like Tranquility, Dignity, and Attends. Underpads provide an extra layer of protection for furniture and bed linens. They can also be used to reposition the body to prevent decubitus ulcers. Disposable underpads are available in various sizes, strengths and absorbencies. Home Delivered also carries washable cloth barrier underpads to reduce waste and keep costs down. Perineal cleanser and ointments help keep incontinent skin looking healthy. Home care products make caring for a parent or loved one at home easier & more comfortable. We also deliver adult sized washcloths and disposable gloves. Absorbency is the most important aspect of an incontinence product when it comes to urinary incontinence. 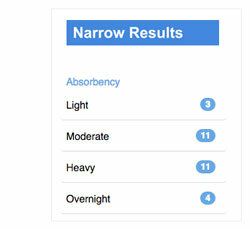 You can use the “Narrow Results” on Home Delivered’s category pages (e.g. Adult Briefs) to narrow down results to your desired level of absorbency. For bowel incontinence, it is important to change right after an event and to use ointments to maintain skin integrity. Absorbency is less important than changing immediately after a bowel event, so using a product that is moderately absorbent and cheaper per piece in conjunction with ointments for skin integrity is the best strategy. Prevail is a great choice if you are looking for a quality product at a reasonable price. Prevail is used primarily in Long Term Care and is what we suggest to first time buyers. Tranquility is our most absorbent brand. We carry Adult Briefs, Underwear, and more. ATN Briefs are the best choice for overnight incontinence. MoliCare Premium Underwear is one of our best pair of Disposable Underwear. MoliForm pads have different levels of absorbency and can be used with MoliPants. Skin integrity ointments that are often used in long term care. Lantiseptic maintains healthy skin that is affected by bowel incontinence. Attends is a good choice if you are looking to save money. They have different levels of absorbencies and a range of product types. Dignity is also a brand that is good quality at a lower price point. The Adult Briefs are perfect for someone that is bed confined that needs to be changed often. Tena is famous for their line of Pads for people that don't want their incontinence to impede them from doing what they love. For light to medium incontinence. Not discreetly packaged. You might be familiar with FitRight products by Medline if you or a loved one used them in a Hospital. Many people like to stick to what they're comfortable with.